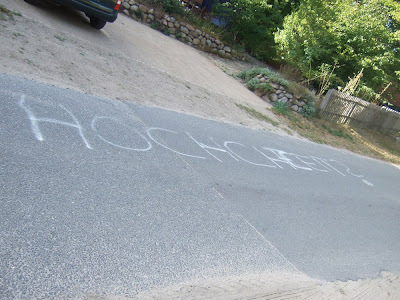 Like this one: A graffiti outside our house. Remember rural romance? This is of the same ilk. ... it reminds me of whitsun weekends, when hordes of guys go around from girl to girl - over 14 (traditional age of consent) and not engaged. Nail a branch next to her window and if she doesn't open the window and invites them in, it gets tarred. - Need to consent? Hm... not strictly required. So - will there be a weddedding? Looks as if my parents' tenant's serial girlfriend habit is raising a few eyebrows. Ok - the white room is history now. A funny, very present and very, very good place to have been for two months. To sort out far more things than I thought I could, hoped I would or even knew they needed sorting. So, we got on pretty well with each other, I soaked up some past, memories and generally a lot of empty white space. And thus offloaded some of my past, memories, and above all: plans and hopes, into the two months and into this large empty room. Many of them will begin to properly unfold as of in eight days (and counting). But until then: a bit of art. I played a few games with myself and this space. Was curious what would happen with this two-months short-term lease in the middle of Kreuzberg, tagged it as a research trip. And research I did. With all the training and cpd stuff I've been doing at work, I've become a lot more experimental and daring with the contexts in which I can work well. And I generally work well in chaos: pull everything out off the cupboards, mix it up and stir and be confident that whatever is important will emerge. So: I tried deliberate confusion. And confused I was. Until, one day - well: 31 july, really, it all became crystal clear. With the White Room as art work I tried to be pushy, determined and rather forceful - after all: time was limited and so very precious. I was intrigued by the bareness, the emptiness and some strong colours. I was also intrigued by this room as outwith time and space. A place that somehow had become unhooked from a past and a future, it only existed as an improvised holiday flat with bare kitchen and people coming and going, leaving some notes while passing but that was all. I wanted, and still want, to capture some of that fleetingness, something that is present, remains out of focus and I can't quite grasp it while all the time I feel its presence. Hahaha.... and of course that challenge made me trip up. It mirrored some of my own confusion over the past two months, but as a wee sideline art project to play with, it was far too ambitious - or, well, maybe not... I could in fact not get it into focus. What I could see in front of my eyes was clear - in white and lime and orange. I was getting myself lost a bit in Matisse - and that has been very useful and exciting. There is something so intriguing about his compositions and his constructions of space. And all the same, I can see far more about what I'm not after than what I can take. But I think that's a productive tension and I will keep asking about that one in Matisse's work. 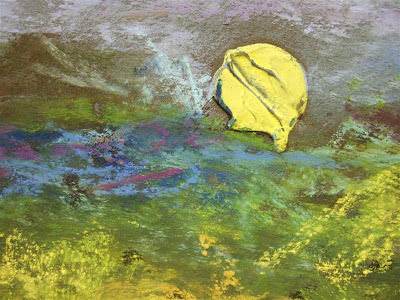 The obvious approach for me seemed layering: I tried tissue paper, with acrylic inks, pastels and other assortments. And was craving for tracing paper. Something more solid, stable than the tissue paper. On the last weekend I finally got some and did a few more turns with it. It's only a small sample in my large sketchbook. It is layered, pulled apart and flipped. It is the view that intrigued me most: an old-fashioned window, with some strong colours and reflections. The layering in itself was not enough. It needed to be spread out and distorted this way. And I think, that idea can go a bit further: onto larger sheets and possibly some other media. It's the space, some definite lines and still it isn't. You think you can see it clearly and yet you can't. The shapes look familiar and yet they aren't. Easily impressed by what's in front of me, let's do a bit of family story telling today. My granddad turned 90 yesterday. So, happy, happy birthday, Friedel! He'd been, first anxiously (so as to not tempt fate) then eagerly planning his big bash to offset the far too many funerals that now mark his diary of events. With having been 'elsewhere' for so long and so persistently, I successfully managed to avoid most family occasions, so much so that I tend to say "there's not much family" where I'm from. Obviously a lie - as the table full of people who I don't know testifies. The village where my mother grew up shares a lot of family from my mother's and my father's side. My dad's uncle lived opposite my mother's parents. And they are all from around there anyway... well, both my grandfathers' families, not my grandmothers' sides. Where am I going with this? To the fields, and to Albert Koenig. But first two tangents: to Reñaca a bit north of Valparaiso in Chile and to my grans's christmas biscuits. Tangent 1: after too much lunch, my dad, Torben and I go for a walk - round the swimming pool, and through some fields... I grin, take some photos. Welcome back, just the right time for late summer fields again. There's the little river, well... a burn really... where my mum learned to swim. We come back and my mum says... "I've been talking about you, and Harald wants to talk to you about Chile." Well, let's talk about Chile. H. is one of the son's of my granddad's best friend. H. has travelled, plenty of times to Latin America, to Africa and to Asia. He wants to retire between Reñaca and Viña del Mar, just north of Valpo. ¡Qué raro! He tells me 'talk some more, Gesa, your German sounds so lovely and strange'. Na, and then the Men's Choir came and sung. Sung some more and drunk some more. It's so rural and villagey, I tend to forget just how familiar this all is, how I can decipher it blind, find it elsewhere such as in rural northwest Scotland and find the markers, the points to orientate yourself by, to trip up and despair over. ¡Raise your glasses, once more! And sing some more about the woods and the meadows, the wind and the darkness, the heathland, the shepherd and a rural idyll that never really was but still warms our hearts. Well... Opa Uelzen... he's (not) the one in the middle of this picture. Albert Koenig: that's tomorrow's programme - in practice, if not in blog. I actually had collected a second song from the radio alongside this, as antidote, but can't think of it what it was... too bad. And, all the while, I'm back in California. A heavy thunderstorm clears the air - just as it does right now outside my Berlin window - , Ate tries out the various setting on the fabulous dSLR, I end up with some very nice portraits of myself in trashy camping van setting with a plastic palm tree in the background, and I read her from Matisse's Notes of a painter. Read her pretty much the passage of my last post - the thriving for a true, thickened and authentic representation of who the artist is on the canvas he paints on. And we're playing time warp - trying to bridge about a hundred years of identity politics, psychology, feminism and subject formation. Try to relate Matisse's sense of self, his belief in his own skills, ability and worth to our visit in California, to Ate, Justin, Kerstin and Fynn and their drag performances between glamour model, business woman and Texan cowboy (a link to Ate's films? Try here), and my own fumblings about person-making by abstract landscape paintings. And it is at that point that I begin to appreciate the ability of different media - other than a paintbrush, pen, paper, paint - to get to what I may be after with my persistently growing tag 'person-making'. 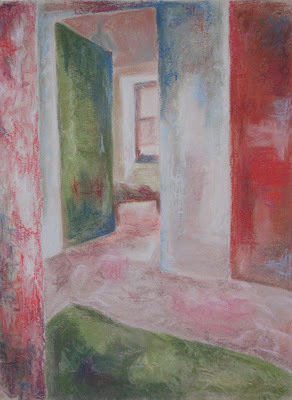 My 'getting to what matters' may happen through life drawing/painting or even photography. But, honestly, I think I need to delve deeper first into more of theory_politics_practice of stuff I know, I've learned and experienced. And with these, I will always end up with some far more complicated than harmony if I seek to condense sensations and experiences. Sorry... there are one hundred years between us... so much happened, unhappened, got lost and won. It does not translate. As you may guess, I am actually pretty pleased with myself over this. For all the stuff that I am concluding at the moment, this is a great point to have arrived at - beginning to set more explicit into relation the art I am doing to the theory and practice of knowledge production that I have engaged in up to this point. The myriad of interconnections are becoming clearer and I am also quite happy by now to talk about them. Put them into relation to each other, to write them into one cv. Good, that has been one of the points I've been aiming at. And I also think this the conclusion of California - certainly not of Matisse - there's more to the White Room, but that will probably have to wait until I'll be on holidays - finally and long overdue - Among the Fields, from Friday onwards. So, after reading the first few of the introductions I've decided to skip them altogether and it makes for much better reading. 3. And all the while the space he creates on canvas is so ambivalent, he thrives for an expression of his own sensations and emotions - by the means of painting - that ranks harmony and serenity above all other sensations. Oops, (3) just acquired words while I was typing. His desire for balance and harmony struck me first off when reading On Art, but all the same the space he creates is so ambiguous, so obvious yet ungraspable. Interesting... is there more in it than harmony? Similarly to Morandi, Matisse's use of flattening of 3D space catches my attention - the trickery, the playful involvement of the onlooker in letting us partake in a game of hide and seek, of appearances, illusions, a bit of shadowdancing and a good performance. In the form of an apparently immobile and fixed STILL LIFE. Ha! Still life, my a***! It is certainly not still. Well... I was planning to cover (2), his use of colour, in this post today, but seeing my ongoing rambling in tangents - while always worthwhile - it seems an ambitious plan. So, maybe I should start with the "I" from the title. I was introduced to Matisse with one of the very first of my pastel sketches/drawings/paintings that I posted on WetCanvas for some c&c, four years ago. I don't remember why I posted a second version of this view from my previous flat. In my mind, this, the first one, is still the better one (even if only on greyboard rather than any proper ground), and if I remember correctly it's still at home behind M.'s wardrobe. For some curiosity, see the link to the discussion on WC here. Matisse was recommended for his inversion of blue and green for distance, red and yellow for proximity. And that I should make up my mind between a more 3d or 2d feel of the image. In Notes of a Painter (1908), Matisse made his first and explicit intervention into how he paints and what he regards as important. And there's a lot in there on order, clarity and what he calls a 'condensation of sensations' which achieves serenity in a painting and supercedes the capturing of fleeting moments and impressions. I love them for their immediacy... pure pigment in stick form and on it goes and it's there. No condensation of sensation for me... rather a bit of a shameless: I feel. I paint. It's there. (Or not). Circling further, I also see how Matisse is thus radically different from people like Eardley or de Stael. The ability of Eardley's paintings to move me to tears stands out, and it stands out as very different to Matisse's pursuit of serenity and harmony. Isn't that all very intriguing!? I will continue. But first, another pastel sketch I found from California. Initially I thought it was from the day when sky and sea become one, but it is in fact from the morning after the fog was beginning to lift, Ate had already gone swimming and I needed to get a bit of the silence of the fog on paper - though I admit, it looks a bit too thunderstormy humid instead of silent. Nonetheless, I am with Matisse when he declares he employs colour to capture sensations and emotions... they are not there to copy nature but to be expressive of his subjective being there. And for that, I am also rather forgiving of the rather rubbish composition of some of the plein air sketches of late... this one's particularly bad and wonky... but it was the sensation of colour that I was after. That's all. One of the results from living lives elsewhere is not only that you may sound funny but also that you are particularly ignorant to all the trivia everyone while here accumulates. Indecisiveness led to silence but last night settled it. I had invited friends for a party in this flat which I will leave in a week. Ambitiously, I had called it Finissage, with the idea being... yes, correct... to have some of the White Room artwork in the White Room. Fat chance... of course that didn't happen and it was just a very nice party with a bit of art work in practice. One of the people who turned up was someone I met first three years ago - in a kosher cafe on the corner of Aza in Rehavia, Jerusalem. He's been in Berlin for the athletics world cup and I. met up with him and he came to the party. The party was a funny mix of German, English and Hebrew with some other people from Israel there too. At some point N. just said... "oh, I love listening to the sound of Gesa's English." Quick I replied "well, listen, that is the sound of thirteen years." Never thought about it, but yes... the way I speak is the result of thirteen years. And this takes me back to some ancient post on the stuff that matters - where I fantasized that if I ever was to study art I would spent years with life drawing and painting since people were what mattered. I'm back with performance and person-making and the ways these inscribe our bodies and make who we are. So, whoever will in future listen to my English will listen to thirteen years of Glasgow, friends from Ireland, a bit poshed up University exposure and some mysterious Stornoway twang. It made me think also of my father's cousin Baerbel, at least that what I think is her name, but in any case it sounds like a good name for her. Baerbel moved to England in the 1950s, not anywhere in England but Salford. The first time I met her was in 1994, when I had just come back from a long cycling tour through the English North and she and her husband were visiting my parents. Wow... and how English eccentric she looked, hairstyle, make up and dress sense. She clearly wasn't from Hamburg any longer but from halfway between Liverpool and Manchester. And the way she talked. How weird her German sentences sounded. Yes... a life lived elsewhere. Over the last six weeks I had funny encounters. To me, my name is terrifically German - sorry: it is not a foreign name. But: "Oh, and how come that your German is so good?" wasn't asked once but I need more than one hand for it. Similarly, my Spanish teacher, after an hour asked again: "And, you are Scottish then? You sound exactly like the other Scottish girl I teach". Well, yes, my Spanish mistakes are English Spanish mistakes, not German ones: I generally translate from English into Spanish because that's how I learned Spanish. Yet, the highlight was someone who, while we, after a day of work, were waiting on the train, asked - in disbelief - "And really, this is your first time that you're in Germany?" Well, I guess I wasn't here for the past 13 years, just listen to the sound of my voice and how I talk. Perfomance... I don't think you need a camera for it, do you? Hm, yes... Talking Heads also belong to here. I've been very lucky with the full moon this year so far, if I count the April moon in Chile and various other occasions. Well, on 6 August while in California it was also full moon, and moon rise and sunset coincided again nicely - I've been racking my geography brain over this (and that is the wrong brain for that, I'm sure), but I don't think it's coincidence, is it? That sunset and moon rise coincide??? Anybody with a better astronomy brain than mine? Na, anyways... the sun sets and the moon rises. Ate films the sea. I film Ate. Ate films more sea. I sketch Ate. Ate still films the sea and finally the moon makes an appearance above the low clouds. Ate now films sea and moon while I'm trying my best to differentiate the pastel sticks. Mildly successful. But all in all a fantastically beautiful evening, lying in the sand, hearing the sea and watching the moon. Sunday morning I finally had caught up on my lack of sleep and woke up early, put on clothes suitable for the 'they see you as soon as you left your bunk bed' caravan site public and went to the sea. I don't know when sunrise is here currently - Germany seems rather dark in summer, but it wasn't that long after and there wasn't any sun really... only fog. Beautifully, eery seafog. Don't know what the local words for it are. Nobody was up yet, all was quiet and so it was just me, the sea, the fog and a very shy sun playing with the mist. I took quite a few photos and I think these will go somewhere with another medium. There's another impression I want to capture, though there are no photos of it, but Ate filmed it - on Monday afternoon on our last swimming outing the day was very overcast, very humid and close as close can be. There was no horizon line between the sea and the sky, it was warm but not many went swimming. The sea was absolutely still and you could swim out far, lie still in the water and observe how water and sky became one. As we lay in the water, trying not to move, Ate dreamt of an underwater camera and I of a painting kit for while in water. A few months ago I found two little books on performing and acting. I read them. That was a bit strange - if there is one thing I never ever liked then it was a stage, a theatre performance or, even worse: ROLEPLAY. But things change, don't they? So, I've been using roleplay as a very legitimate tool for some of the workshops and group work I've been doing. While I was reading the little book on stage performance and acting I took note for my list of things I really, really have to do. Be on a stage and act, play, sing. Hm, singing... I'm still not convinced about, but the rest firmly made it onto my list. The list also functions as 'Things I'm scared about but that's not a good enough excuse'. So, while in California, we reappropriated a broken bbq to integrate properly into the camping community. But somehow our staged performances upset the integration. Just as well that ageing Hollywood Diva Glitzi had to leave after a short appearance. This was enough though to rattle one or two otherwise rather bored campers to come asking for her (and us) repeatedly over the next days. But we finally managed to scare them away. The sunset picture wall doesn't quite make a stage but the camera is a very expensive and proper one and so was the boom (I can now validly add sound technician to my list of skills). And so appeared Ulla Wagner, 47, whose husband Woelfi promised her a honeymoon in California. But really only ever meant Kalifornien at the Baltic Sea. What on earth to do with your dreams after such a disappointment??? Well... dreams? They are for other people! Ulla and Woelfi have their very own California with a once new campervan. Uncannily, our first proper interview was with someone who'd been coming to the camping site for 30 years, was in his 80s and while he told Ate behind the camera the good things, the sad things and broken dreams were for the sound technician standing to the left of him. Become someone else in front of a film camera. Also: Tick. The exhibition opens on 16 October at the Kunstraum Bethanien, Kreuzberg, Berlin. And I am soooo curious what she will do with 9 hrs of film, 800 stills, 10 interviews, lots of sea, sand and camping idyll. The sea? That's next. How wonderful it was, and so close to the once new camping van. ... only a few more hours and then I'm on my way to the sea... and the weather forecast is fabulous. So, besides a lot of other things, I am optimistic to have at least a few photos and drawings when I come back on Tuesday. It's my friend Ate's final project. 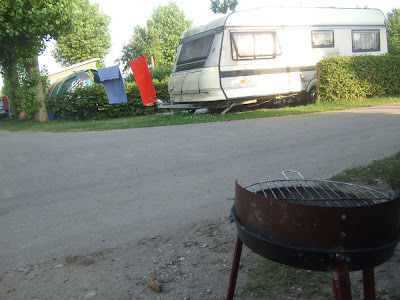 A short film about Kalifornien/California and the normality of North German camping sites. More on that later. But I just remembered one thing that Ate gave me when I was leaving for Glasgow. It was a large ink drawing with a very sparse blue added to it - a portrait, and one of Khalid Gibran's little stories. "Thieves, thieves, the cursed thieves." cried, "Blessed, blessed are the thieves who stole my masks." I just looked it up again and had to smile. Strange how some themes of your life remain rather constant. So it did for her and so it did for me. And I smile some more because she was there that summer in 1996 and she is here this summer too. I guess I'm back. Have a good weekend, a bit of seabreeze, sand and sunshine. Chris made this fabulous comment on my previous White Room experimentation: to look at Matisse and how he arranged objects in space. A small collection of Matisse's cut-outs with some commentary: Ralf Schiebler, Henri Matisse. Scherenschnitte, Schirmer/Mosel, 1994. (sorry, there's not really much to see about this book online. So, I've been reading these books on my various journeys across Berlin's public transport system for the past week. I sought out the cut-outs for a variety of hunches: to flatten space, to simplify space and to make objects moveable - to be placed and shaped where one likes. In that, I explicitly ignored Matisse's numerous earlier paintings of decorative still life and the curious games he plays with them with the construction of space. And thus I stumbled to the extraordinary end point of someone's extraordinary artistic career. Which clearly doesn't make for an easy starting point for someone else. And neither should it. So: we need a series of diversions, complications and confusions if this is something to work with, on, besides. Let's start with a couple of his cut-outs. Yes?! 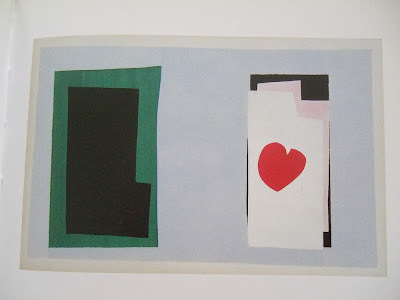 Note the limited colour scheme; note how the different forms do not touch each other; note that in print the depth of the collages is lost; note how the heart makes the rest of the construction fall out of place - passionately. It's constructions of space by cut out - the practice of cutting shape into colour - there is little more direct in approach than how Matisse - so late, and after decades of searching - stumbles onto this new medium that in its simplicity provides such clear expression. Playfully innocent and all the same something to arrive at after years of searching. Positive and negative shapes, space; the frame is as important as what is (not) inside. And yet: the positive remains incongruent to the negative; the forms do not match; do not exhaust themselves in each other. Instead, they are subtly changed, amended, rounded, flattened; so: one is not the opposite of the other. So, I'm standing on the sidelines and my jaw is dropping in awe.